For the Morrison government, these words, admittedly technical and dry, are the stuff another galaxy, pressed to the outer reaches of the cosmos. The IPCC report did not, according to the prime minister, “provide recommendations to Australia”, leaving his government to pursue policies to “ensure electricity prices are lower”. Scientific, research based opinion is just so-o-o-o inconventient! It really doesn’t agree with what we want to do, does it?! Here we have Morrison giving $5 billion for a farmer’s drought fund and nothing to the man-made climate that is causing the numerically and severity increasing extent of the droughts. Well said Dr Kampmark! Yes this useless lot of lying, right wing, flat earth, climate change denier, inept, obscenely over-paid (& seemingly, doing almost nothing to account for these obscene wages too! ), bloody ignorant so-called “liberals” are an absolute disgrace. 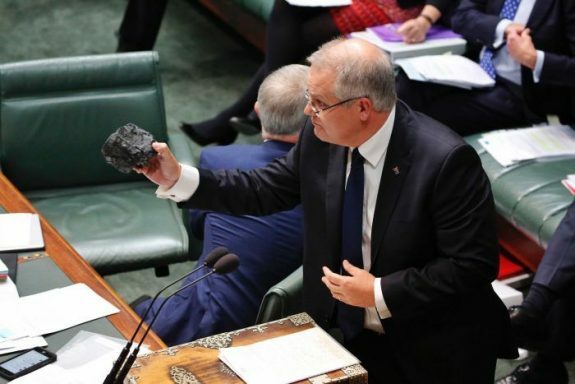 Regardless of who is our PM–& that seems to change on a regular basis!–NO ONE in the liberal/national mob seems to understand just what is happening to the world’s climate & just what Australia should be doing. We DEFINITELY do not “need” any more effing coal mines in this country! In fact the entire world does not “need” any more coal mines or coal-fire power plants either! We really should be looking into the new nuclear power stations that are being constructed in some countries, which, from what I have read, are really not much like the 1950’s types of nuclear power stations, some of which are still in use & still very unsafe & still polluting the atmosphere. Alternative energy sources such as wind farms, solar power, tidal power etc are all well & good (in theory), but all have massive drawbacks which have to be over come before they are reliable for everyday energy requirements. Certainly all these are for superior, less harmful to our planet & do not involve digging huge holes in the ground & transporting in huge cargo ships all over the world! I have read many of your articles on this site and others, such as Dissident Voice. I have always found those articles to be cogent and well-reasoned, and yet, I have never written to thank you. Let me fix that. Thank you. Are you aware that an attack ad against the Andrews govt. is running on this page? What is more irritating is that it is lies. On second thoughts, let it run! The libs can waste their money on this site. The more the better! totaram, I think you will find that the owner of this site has no say as to which advertisements the agency runs on this site. As an aside I went looking (on the internet) for timber blinds some months ago. I now am inundated (on this site) with ads for timber blinds. totaram, Matters not is correct. We do not control what ads appear on the page. The ads are different for every visitor. I might see a particular ad, and you might not. The ads are based on a few things: the user’s web-browsing history; the content on the site; and I’m beginning to think that the user’s geographical location might determine the type of ad too. On the latter, whatever web site I’m on (and it some aps too) I will always get an ad for our local Liberal member. The only thing we have control over are the type of ads. For example, I can stop all political ads. MT : yes, thanks. I realised after I wrote the first sentence, that the ad was for me. Hence I will not block it! I will never vote for the coalition, so let them rip! You get the money, the liberals pay. What is not to like? Ha, ha! Correct me if I am wrong.